The health benefits of wheat germ are enormous. It is a grain fortified with vitamin E, folate (folic acid), phosphorus, thiamine, zinc, magnesium and essential omega-3 fatty acids and fatty alcohols. It is an excellent source of fiber. The grain of wheat which gives rise to a new plant when sowed is called the wheat kernel or wheat berry. It is the seed which gives birth to the embryo. The germ is that part of the wheat grain which helps in reproducing the plant and therefore has a high concentration of all the nutrients. The good healthy fat in the grain is mostly found in this part. The bran is the outer fibrous layer. The middle layer between the germ and the bran is known as the endosperm. It is this part which is actually milled for flour. When wheat is processed to make everyday all purpose flour, the germ and bran is removed and thrown. THIS IS THE BRAND I BUY! More and more research shows the advantages of incorporating the germ in our daily diet. 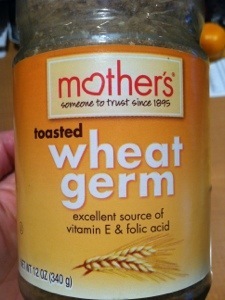 Due to high levels of nutrients, the germ is separated from the grain and made into health supplements. 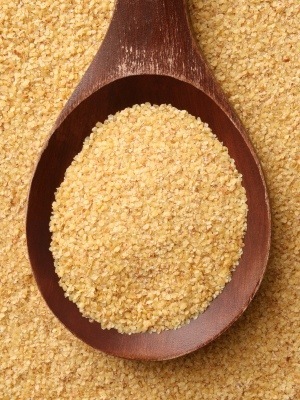 I love adding wheat germ to my oat meals, pancake mixes, muffins, and cake batters. Vitamin E found in it, is a powerful antioxidant when it comes to skin health and beauty. Vitamin E boosts immunity and has anti-aging properties and can prevent heart diseases and even cancer. It can help control LDL cholesterol and triglycerides and promote cardiovascular health. Wheat germ protein aids in muscle development and does wonders to overall energy, stamina and wellbeing. It contains octacosonal which improves mental agility and alertness. It is used in supplements, especially the ones used in weight loss. It also improves metabolism and balances the hormones in the body which in turn helps to cope with stress. Vitamin B boosts immunity, aids digestion, gives healthy skin and enables the body to heal quicker from wounds. Folic acid brings down the homocysteine levels in blood and prevents damage to the arteries. The unsaturated oils extracted from wheat germ are a rich natural source of vitamin E. Wheat germ oil can be used as a supplement to boost your intake of this vitamin, which promotes red blood cell formation and supports your immune system. Vitamin E may have antioxidant properties which counteract cellular damage and reduce the harmful effects of environmental toxins. Some cosmetics companies promote wheat germ oil as a product ingredient that may moisturize skin and hair, diminish the effects of aging and reduce the appearance of scars. Pingback: Purple Power Smoothie | Good Morning Merry Sunshine!